Princess Diaper Cake Discounts Apply ! 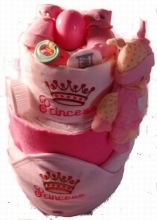 The Little Princess Diaper Cake is the perfect gift for the parents of a little girl. Filled with princess-themed goodies, this precious diaper cake makes a wonderful baby shower centerpiece or a very thoughtful welcome baby gift. Your cake will be custom-made by our bakery to ensure freshness of items and a true unique diaper cakes. Cakes may not be exactly as pictured due to creative differences and product availability. Please be assured that all items in your cake will be equally precious as those pictured.